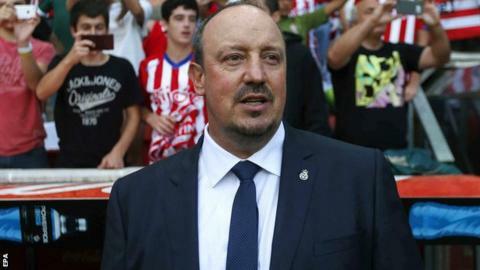 Real Madrid were not clinical enough in front of goal as they drew their opening La Liga game 0-0 at Sporting Gijon, new coach Rafael Benitez says. Benitez's side, who included Cristiano Ronaldo and Gareth Bale, had 27 shots against their promoted opponents, but only eight were on target. They also failed to score in four of their eight pre-season games. "We lacked precision in the final pass and accuracy in the shots on goal," said Benitez. "In general, we lost the ball too much in the first half and gave them a lot of opportunities to counter-attack. "In the second half, we had more control, more possession, more danger - but without that final pass to leave you with a clear chance at goal. "We will continue to tweak and improve things like the physical condition, the precision and the co-ordination between the players and in that sense I remain optimistic." In an opening weekend of few goals in La Liga, champions Barcelona won their opener 1-0 at Athletic Bilbao, with 2014 winners Atletico Madrid winning by the same scoreline against Las Palmas. Madrid captain Sergio Ramos said: "It's clear that the first half wasn't good at all. "In the second half, the team controlled possession a lot more, we took the initiative. But the few chances we had, we didn't take."